On the Water announced yesterday that they are changing the structure of the long-running Striper Cup, eliminating all weigh-ins from the format. With this move, OTW will look to move toward a catch and release-focused tournament model. The obvious goal here, besides the encouragement of catch and release for tournament participants (and of course, some positive PR for the media group), is to evolve the tournament structure in a way that meshes with the current climate of striper fishing. When I saw the social media post, I fully expected to see an angry hoard of snowflake-screaming users pledging to never buy an issue of OTW again. But surprisingly, the comments are and continue to be mostly tame. There are some “this should have been done years ago,” but as a whole, this vocal group supports the decision. This initial reaction proves that we all have common goals and beliefs when it comes to our pursuit–we care about the striped bass. We care about the future of the stock. What’s the point in teaching our kids to fish in the salt if there’s a moratorium in 10 years? It happened with trout and it’s happening with stripers. Catch and release has and will continue to become the norm when targeting these fish. This is a great move by a regional industry giant. This, along with the Division of Marine Fisheries proposals to prohibit the use of a gaff on striped bass and mandate the use of in-line circle hooks when using live or cut bait, tells me that a change is-a-comin’. Agencies across the Northeast are stepping up. It’s time for us–the weekend warriors, striper diehards, canal rats, captains–to step up too. In light of this recent decision by On the Water, I thought a “caring for your catch” post may be a timely blog. The goal here will be to explain how to care for your catch, whether you plan to keep the fish for the table or release it to be caught another day. In case you haven’t noticed, I lean more “bleeding heart conservationist” than I do “kill-em-all-striper-slayer.” But this doesn’t mean I don’t keep the occasional fish for the table. I’m not someone who will beat you up and shame you on your Instagram for keeping a fish. I love striper. It makes excellent table fare with it’s mild flavor and firm texture–grilled, baked or fried. Catching a striper, keeper or not, laying it on a dry deck or in the sand, holding it up for a 10 minute picture shoot and then throwing it back into the water without a revive. Catching a legal striper and letting it suffocate to death in a hot fishbox or on the beach. This is not only cruel (I don’t care if you tell me fish can’t feel things, my brain that tends to anthropomorphize fish tells me otherwise), it spoils the fillets. Then, using a dull knife to butcher a few thin fillets and letting them get freezer burn. These usually end up in the trash or the dog bowl when making room for Thanksgiving leftovers. We need to fix this. We have two constituents here; the first one being made up of anglers who just don’t care. They’re going to do what they want when they catch a striper. And for them, this blog won’t help. To be honest, that constituent isn’t even reading this blog. But many others just don’t know how to care for their catch. There has to be an educational component. This blog will hopefully give you some insight into how to care for your catches, whether you plan to keep them or not. This is an easy one. The longer you fight a fish, the more likely it is to die. It’s that simple. Don’t fish for stripers with your 5wt. Don’t play a fish just because you want to. Fight the fish and get it in quickly to limit mortality. I know, this is a mantra that get’s poked fun at quite a bit. It can be tough to keep a fish in the water from the boat when removing hooks. But whatever you do, don’t lay the fish on the dry deck of your boat. Wet your hands when touching the fish. This ensures the protective slime doesn’t come off. I get it. You caught a big fish and you want to get some pictures. That’s fine. But keep track of how long the fish has been out of the water. If you’re going on a minute to 90 seconds, it’s time to get that fish back in the water. This is a two-pronged positive. Barbless hooks decreases the time a fish spends out of the water, as getting a barbless hook out is much less time consuming than getting a barbed hook out. Also, do you want a barbed hook in your hand or a barb-less hook? Thanks to MA DMF for the illustration. Use circle hooks! And only the inline kind! Offset hooks are just as bad as J hooks. Using a circle hook greatly reduces the chance of gut hooking a bass, as the circle shape (inward pointing hook point) is much more likely to gain purchase in the corner of the bass’s mouth. For live mackerel fishing, we use Gamakatsu 3/0-6/0 Inline Circle Hooks. I get it–it can be a a big change to move from J hooks to circle hooks. But might as well start soon. It may be mandatory in the near future. Listen, gut hooks happen, even with circle hooks. If a fish is bleeding through the gills, it’s most likely not going to survive. Striper mortality rates that are caught and released are around 8%*. If a fish is bleeding from a gut hook? Wayyyyy more than that. If it’s over the legal limit and under your bag limit, you should keep this fish. Period. If a fish under the legal is gut hooked, cut your leader a few inches above the mouth of the fish. Don’t try and work the hook out. Again, this one is two-fold. Additional trebles can damage a fish with more points to stick in gills and gut. Also, do you like hooks in the hand? Me neither. For most of our plugs, especially when there are schoolies around, we keep only one treble on the plug. Holding a big heavy fish vertically can cause serious damage to its internal organs. Hold the fish horizontally if you want to get a picture, supporting it through the tail. This is the most important tip on this list. After you catch and land a fish, it’s not enough to just throw it back into the water. There are right and wrong ways to revive a fish. Depending on the time of the fight, water temperature, size and age of the bass, reviving can take anywhere from a few seconds to ten minutes. Hold the fish horizontally in the water, and move it in a forward direction so that water runs through the gills. Do not run the fish back and forth in the water. Continue doing this until the striper shows signs of life. 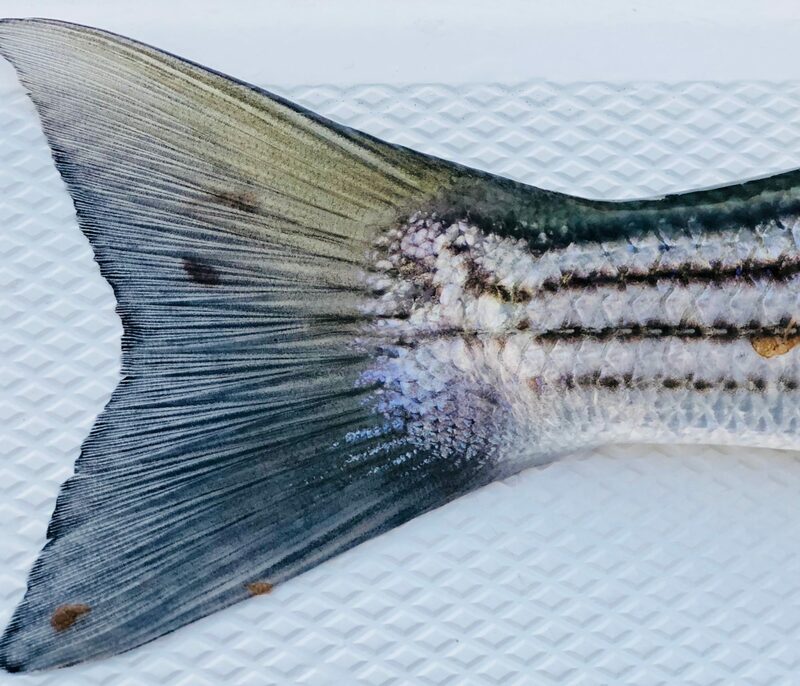 When the striper is ready, the dorsal will shoot up and it will bite down on your thumb. When it seems ready to go, let it do its thing and swim away under its own power. You’ll usually get a “thank you” splash from the tail as it swims away. When you decide to keep a fish, you should bleed it immediately. On a striped bass, do this by severing the artery directly between the gills and give the gills a few good rakes with your knife. Blood should pour out of the cut pretty good. If possible, angle the fish down. If done effectively and quickly, you’ll notice considerably better fillets. Fish going home should be iced immediately. Add a little saltwater to get that slushee going. Again, this greatly improves fillet consistency and taste. If you can fillet on your boat or close to the water, always wash your fillets in clean saltwater. Fresh water should never be used, especially if you plan on freezing the fillets. This turns your defrosted fillets into mushy messes. If you have to use freshwater (us boat guys need to bring our fish home whole so we find ourselves filleting at home more often than we want to), make sure to dry the fillets as best you can before cooking or freezing. Or, bring a 5-gallon bucket of saltwater home. When filleting any fish, a sharp knife is your best friend. A good sharp knife will make it easier to get clean cuts off the rack. On bigger fish, eat the cheeks and shoulders. Some of the best meat can be found here. Or, you can steak it. For fish that you’ll eat immediately, leave the skin on. This keeps the fillets moist as you cook them on the grill. Skin any fish you’re going to freeze. Fish is meant to be eaten fresh. Cook the fillets up within a few days of eating, Or, give to a neighbor who loves fish. I’m sure we all have a few of these. Freezing fish effectively can be tough. This is why I bought a vacuum sealer. I can keep a properly stored fillet frozen and in great shape for up to a year. Nothing better than a striper fillet in January. Frozen fillets also make great fish soup or stew.